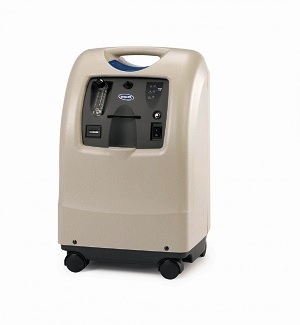 The new Perfecto2 V oxygen concentrator is perfect for home use. The Perfecto2 V has a new economical price, yet offers the features of the original Perfecto2. The new V series offers quiet, uninterrupted operation with a 3-year warranty. The Perfecto2 V incorporates all of the great features of the Perfecto2 concentrator – HomeFill oxygen system compatibility, energy efficiency, small size, lightweight, and sound reducing treatments, to offer the quietest 5-liter concentrator Invacare has ever produced. Easy access Filter on back of unit. The added noise reduction to achieve a sound level of just 39 dba. 60% quieter than the original, the Perfecto2. 92%quieter than Platinum XL concentrator. The new Perfecto2 V is the smallest, lightest, quietest and most energy efficient 5-liter concentrator ever produced by Invacare for homecare use. The high-performance Perfecto2 W unit incorporates all of the best features of the market-leading Platinum XL concentrator, while significantly improving upon the key specifications of the Platinum XL. The Perfecto2 V (IRC5PO2V) SensO2 feature monitors the purity of oxygen generated by the oxygen concentrator. If purity falls below factory preset standards, indicator lights on the control panel will illuminate. Compatable with Home Fill Systems. The Perfecto2 V powerful compressors are compatibility with Home Fill oxygen tank filling systems. This system also has a direct hook-up for homefill units so you can use it as it while it is connected and filling the Homefill system. Range: Altitude up to 8000 ft.
Save on utility bill, it's Green! If you are looking to own your own concentrator rather than renting, you'll pay for the cost of this concentrator in 6-7 months.